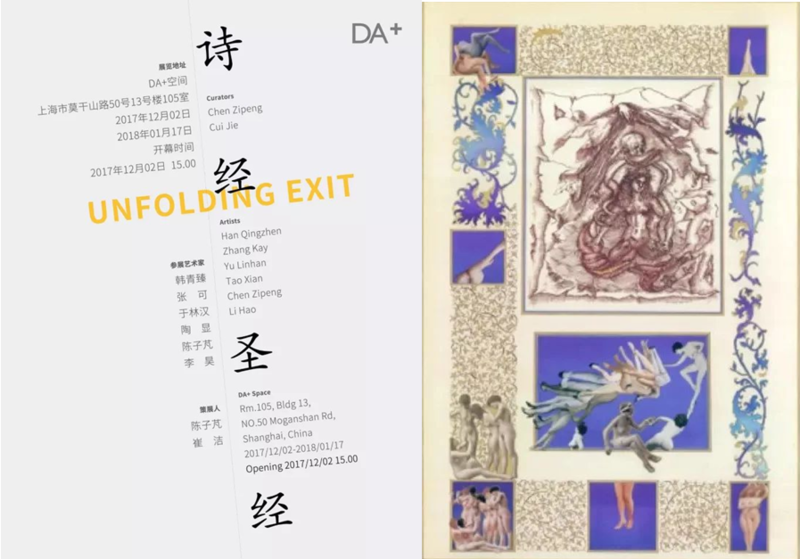 On November 25th, 2017, the group exhibition "Unfolding Exit", co-curated by young curators CHEN Zipeng and CUI Jie was opened in DA+ Space. The exhibition focused on the sensible comparison of Eastern and Western cultures. And it presented young artists who graduated from the Central Academy of Fine Arts (CAFA). In the process of studying in the West, the rethinking on their own cultural identity was finally reflected in the experimental visual language with different styles. The participating artists in this exhibition are ZHANG Ke, CHEN Zipeng, TAO Xian, YU Linhan, HAN Qingzhen and LI Hao. The exhibition will be held from December 2, 2017 to January 17, 2018.